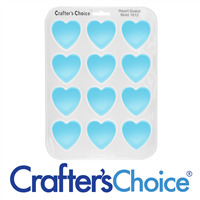 Design a lovely new soap design with Crafter’s Choice® Lips Column Mold. 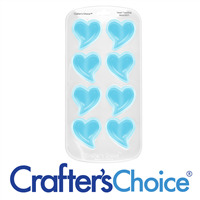 Create soap for Valentine’s Day, bachelor parties, or bachelorette parties with this unique mold. 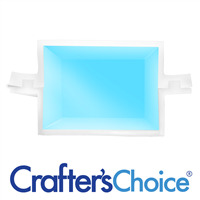 Embed fits in Crafter’s Choice Regular Loaf Silicone Mold 1501 and Rectangle Regular Column Silicone Soap Mold 2009. This soap column mold makes one lip soap column that can then be embedded into a larger loaf. 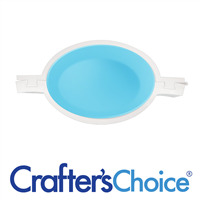 The silicone construction allows for easy soap removal. One side of the mold is hinged with edges on three sides that seal closed. This mold does not stand on its own. We recommend leaning it against an upright mitre box or a sturdy object before filling with soap. See “Directions” for more information on how to use this mold. Bar Cavities: 1 Bar Depth: 0.75"
Bar Length: 8.125" Bar Width: 1.75"
Melt & Pour Soap: Close the mold by firmly pressing the edges together. For added safety, clamp the edges. Slowly pour melted soap no hotter than 130ºF into mold. Allow soap to harden then open mold and remove soap. Trim edges with a potato peeler or spatula. Embed soap into a loaf or slice into bars. To minimize bowing, fill in three pours. COMMENTS: I have used this over and over again with melt and pour and it works great. After heat and several trips into the sink, the seal holds well.